In the beginning, atherosclerosis was considered to be the result of passive lipid accumulation in the vascular walls. After tremendous technological advancements in research, we are now able to almost admire the complexity of the atherosclerotic process. Atherosclerosis is a chronicinflammatory condition that begins with the formation of calcified plaque, influenced by a number of different factors inside the vascular wall in large and mid-sized arteries. Calcium mineralization of the lumen in the atherosclerotic artery promotes and solidifies plaque formation causing narrowing of the vessel. Soft tissue calcification associated with tissue denegation or necrosis is a passive precipitation event. The process of atherogenesis is mainly driven by CD4+ T cells, CD40L, macrophages, foam cells with elevated transcription of many matrix metalloproteinases, osteoblasts, cytokines, selectins, myeloperoxidases, vascular adhesion molecules (VCAM), and smooth muscle cells. Our knowledge in the genesis of atherosclerosis has changed dramatically in the last few years. New imaging techniques such as intravascular ultrasound or IVUS have made possible to investigate atherosclerosis in early stages. Arterial calcification emerges from two different types, the medial-elastin dependent and the intimal, both of which are directly related to atherosclerosis due to osteoblast differentiation of vascular smooth muscle cells. The deposition of minerals in the form of calcium (Ca2+) initially emerges from the inorganing mineral octacalcium phosphate [Ca8H2(PO4)6.5H2O] to the form of Hydroxylapatite [Ca10(PO4)6(OH)2]. 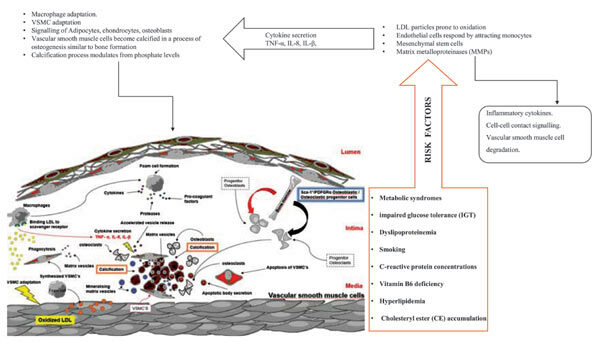 This review is devoted to broaden the understanding regarding atherosclerosis and the central role of calcium in the development of the condition. Atherosclerosis, calcium, cardiovascular disease, immune system, inflammation, osteoblasts, vascular endothelium. 1st Cardiology Department, University of Athens Medical School, “Hippokration” Hospital, Vas. Sophias 114, 115 28, Athens, Greece.